So read the sign greeting throngs of pie admirers and aficionados as they crowded the Hyde Park Neighborhood Club last Saturday for the fourth annual South Side Pie Challenge. Pie bakers of all ages manned their creamy and crusted creations behind four long tables, each representing one of the competition’s categories: fruit pies, nut pies, cream pies, and—in the spirit of all things autumnal—pumpkin and sweet potato pies. Visitors milled about, perusing the diverse array of cleverly named and carefully adorned confections. The only thing unsavory about the whole affair was the tough choice of which pie to spend tickets on—before entering the room, visitors purchased tickets to exchange for pie—three dollars per slice or $10 for four slices. Not even the most Herculean of stomachs could have found room to give each of the entries a fair slice of the pie. Hyde Park residents Julie Vassilatos and Kate Agarwal founded the South Side Pie Challenge in 2012 after Agarwal participated in the Bucktown Apple Pie Contest, an annual event on Chicago’s North Side. The women noticed that the presence of South Siders was severely lacking in Bucktown, so they decided to bring the idea of a pie challenge home to Hyde Park. All of the proceeds raised benefit the Hyde Park and Kenwood Hunger Programs food bank. There are no overhead fees, the prizes come from donations from local restaurants, and other expenses—such as flyers, web service, and paper cups and plates—are paid out of pocket, according to Agarwal. This year’s challenge raised around $3,000, a sum exceeding that of any previous year. Many of the contestants cited the worthy cause as a motivating factor behind their participation. “This event is a fun activity to participate in, but moreover it supports an amazing cause—food pantries—especially at a time when so many families are without Thanksgiving meals,” Maya-Camille Broussard said. Broussard is the founder of Justice of the Pies, a company specializing in pies and quiches established in honor of her late father, a defense attorney with a passion for baking. On Saturday, she earned several new honors: first place in the pumpkin and sweet potato category for her Pumpkin Praline sprinkled with pecans, and second place in the fruit category for Black and Blue, a zestful rendezvous of blackberries and blueberries. Other noteworthy contestants gracing the tables at the event included the Pear-fect Custard Pie, Yes Pe Can, Cheers to Chai Town, Darth Pumpkin, and—not to be forgotten—Deez Nuts Pecan Oatmeal Pie. Some names were less descriptive and more intriguing. The Tempest, for instance, lived up to its gusty title with a whirlwind of rich flavors—chocolate, caramel, and pecans—tossed together. Other names presented the opportunity for historical enlightenment: the Velvet Elvis gave its lucky consumers a taste of the King’s favorite snack—peanut butter and bananas—in pie form. Vying for the prize ribbons, contestants brought their best to the table in woven lattice tops, elaborate cutouts, and crusts of optimal consistency. 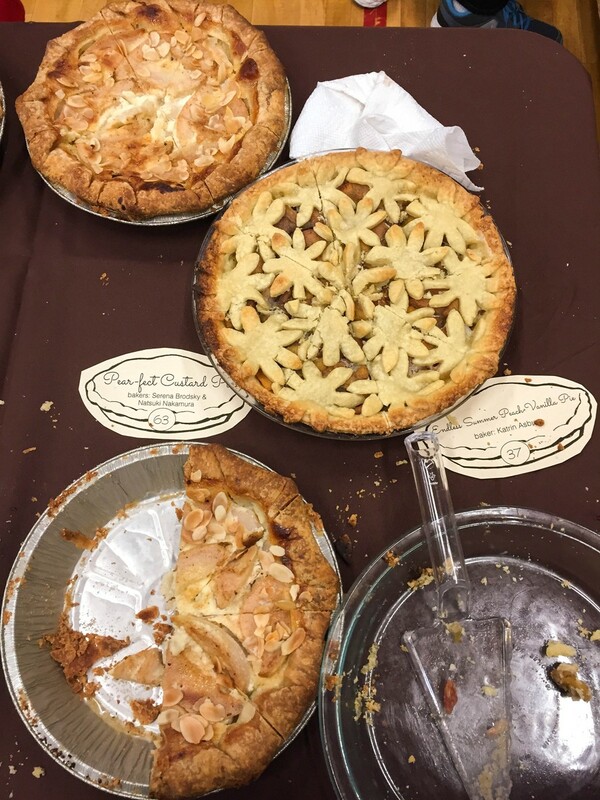 Between the experimentation with unorthodox flavor combinations and creative methods of adhering to the rules, visitors did not leave hungry for missing varieties of pie. But above all, the event was flavored by a sense of community. Agarwal emphasized the event’s goal of fostering inclusivity and togetherness, as well as her desire for a stronger student presence at future Pie Challenges.